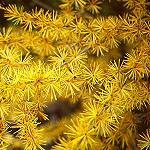 Common juniper is the only member of the cypress family native to Scandinavia. It has the widest distribution of all conifers. The berry-like fruits are two years before they ripen, turning from green to blue. 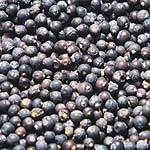 Juniper berry oil is obtained by steam distillation of the ripe fruits. It has a dry and fresh piney odour with notes reminiscent of French turpentine, and is the characteristic aroma ingredient used in gin. 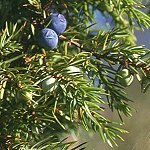 Juniper berry oil is also used to a limited extent in masculine perfumes. Its main constituents are alpha-pinene and sabinene. 1-Terpinene-4-ol is the major oxygenated component  . Etymology: gin, abbreviation of genever, from Dutch jenever, from Lat. Juniperus. This ancient genus has been on Earth for many millions of years, but today it is represented by only two species native to Japan and China, C. japonicum and C. magnificum, the latter being endemic to central Honshu. 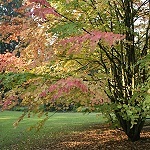 Katsura is one of the largest hardwoods in Asia (up to 45 m), but it is also grown as an ornamental tree within temperate zones for its delicate heart shaped leaves and bright autumn colours. In Denmark, for example, it is occasionally found in gardens, but here it only grows to a limited height. 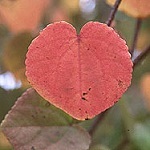 In the fall the leaves are colored beautifully yellow, purple and red. The dying leaves give off a remarkable sweet aroma similar to burnt sugar (caramel) due to maltol which accumulates in the leaves as the glucoside and is liberated in the decaying leaves. Levels as high as 2 % of maltol have been demonstrated  . Etymology: Lat. Cercidiphyllum, i.e. leaves like Cercis, the Judas Tree, Cercis siliquastrum (Fabaceae). cyclic C6-compounds derived from carbohydrates and characterized by a planar alpha-enol-carbonyl structure. This structure offers a hydrogen donor (the -OH group) adjacent to a hydrogen acceptor (the =O group) and could possibly bond to a -CO-NH-sequence in a polypeptide of the olfactory receptor. An increase in hydrophobicity of these compounds correlates with an increase in their odor intensity. Thus "ethyl maltol" (which does not occur naturally) is about five times as powerful as maltol (the same tendency is seen with vanillin and ethyl vanillin) . The very intense caramel flavour compounds play an important role as trace constituents in the aroma of many foodstuffs - from strawberry and pineapple to freshly baked bread and coffee. The Cypriotes mixed labdanum with styrax and calmus oil, thereby creating an early masterpiece of perfumery. The Crusaders, when they conquered the island, became so enthusiastic about the fragrance that they brought the recipe to the rest of Europe. 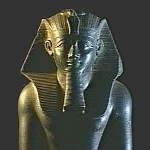 Known as the 'Chypre'-theme, it is still employed in modern perfumery. Cyprus, Crete, the Esterel Mountains in southern France, Spain and Portugal are the main production sites of labdanum. Today the crude Labdanum gum-resin is obtained by treating the cut plants with hot alkaline water to catch all the surface waxes, resinous matter and oily parts from the plants. Steam distillation of the gum yields about 2 % of labdanum oil, which is extensively used in perfumery. It has a powerful, diffusive and very substantive odour with strong notes of incense and ambergris. The oil is an extremely complex mixture of mainly oxygenated terpenoid compounds C10-20. Weyerstahl et al. detected more than 300 constituents in a sample of commercial labdanum oil, 186 of which were identified. The main compound was ledene (9 %). Among the constituents having an ambery odour, alpha-ambrinol, ambrox and drimenone were identified . By using GC with sniffing, Ramalho et al. found that 2,2,6-trimethyl-2-cyclohexenone was an important woody-smelling constituent of labdanum oil from Portugal . 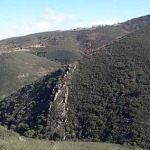 The photo on the left shows the typical sight of a slope covered by dense stands of ladanifer bushes as seen from a distance. 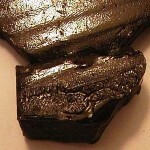 The photo on the right shows lumps of crude resin. 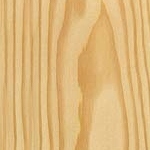 European larch is a native of the Alps and the Carpathian Mountains. The genus consists of large, deciduous forest trees with soft needles in bundles (the picture on the left shows the needles in the autumn). 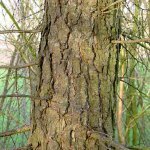 The bark of young larches contains the compound maltol (3-hydroxy-2-methyl-4[4H]-pyranone), perceptible by its sweet smell when the trunk or branches are sawed . For that reason maltol is also called larixinic acid. Maltol belongs to the group of 'burnt sugar' aroma chemicals being C6-alpha-enol carbonyl compounds (se also Katsura, fenugreek and strawberry). Maltol is also found in the aroma from freshly baked cakes. 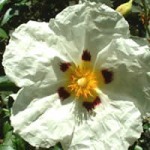 L. siler has its home in the mountains of central and southern Europe. It is a heat-loving perennial about 1 m high often found among rocks at the edge of woods. 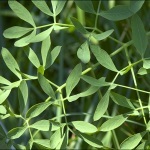 Its stout foliage is elegantly shaped and beautifully blue-green. 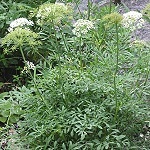 When this umbellifer is grown as an ornamental plant in gardens its foliage may be used as a lovely greenery with cut flowers. In German, L. siler is called Bergkümmel, meaning "mountain cumin". The seeds have a very powerful and distinct smell when broken. 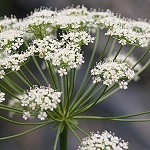 As with other seeds of umbellifers their cavities are rich in essential oil. The one of L. siler is completely dominated by only two ingredients: perillaldehyde (89.5 %) and limonene (10.5 %) . The smell is sharp and richly cuminic. The seeds have been used as a spice and in herbal medicine. Interestingly, the oxime of perillaldehyde is a sweetener that is about 2000 times as sweet as sucrose. 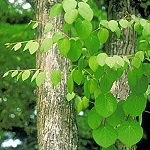 It is mainly used in Japan and is also known as Perillartine or Perilla sugar. Etymology: perillaldehyde, from the Labiate Perilla frutescens, in which it was first identified. 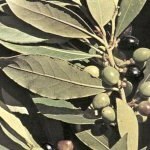 Laurel grows in all the Mediterranean countries, especially along the coasts. It is one of the oldest cultural plants and one of the most legendary. The laurel wreath is a symbol of honour, still used at prize awards, etc. (Fr. lauréat). 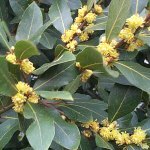 Laurel has given name to its family (including also cinnamon, camphor, rosewood and avocado). 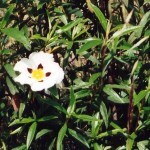 The essential oil is located in oil cells, visible as transparent dots in the leaves. They are used whole and dried as a spice. Laurel leaf oil is obtained from the fresh leaves by steam distillation. Its main components are 1,8-cineole (39 %), alpha-terpinyl acetate (18 %), linalool (10 %) and methyleugenol (12 %) .